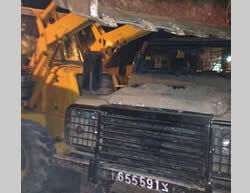 At attempt to use the blade of a tractor to damage an IDF jeep at a military base near Al-Ram (IDF spokesman, October 17, 2013). 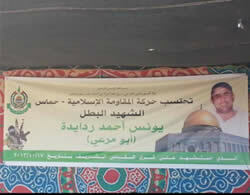 Relatives of Palestinian terrorist Younes Radeideh erect a mourning tent in Beit Hanina (Al-Salaam TV, Tulkarm, October 19, 2013). The official announcement of Younes Radeideh's death hung in Beit Hanina by the Fatah movement in al-Ubeidiya mourns the death of the "heroic shaheed"
The Hamas obituary for the "heroic shaheed," Younes Radeideh (Abu Mari') (Quds Facebook page, October 20, 2013). 1. On the evening of October 17, 2013, a Palestinian driving a tractor tried to enter an IDF base near Al-Ram (south of Ramallah). He drove at high speed toward the base fence, crossed it and tried to run over IDF soldiers and used the tractor blade in an attempt to turn over a jeep. He was shot and killed by an IDF force. An IDF soldier sustained minor injuries when he was hit by a flying object during the incident (IDF spokesman and Ynet, October 17, 2013). Fatah and Hamas praised the attack; so far the Palestinian Authority (PA) has not issued a statement regarding the attack. 2. 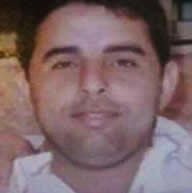 The terrorist who carried out the attack was Younes Ahmed Muhammad Radeideh from Beit Hanina (Wafa News Agency and Palestine Online, October 17, 2013). According to reports, his brother, Mari’ al-Radeideh, carried out a vehicular attack on March 5, 2009, near the Teddy Stadium in Jerusalem (See Appendix). 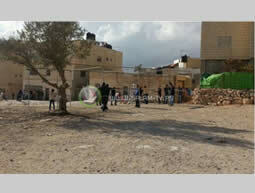 According to Palestinian sources, before the attack his family received an order to raze their house. The family originally came from the village of Ubeidiya (east of Bethlehem) but currently lives in the Al-Ram area. 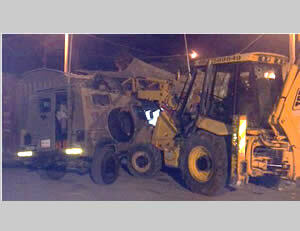 The terrorist who carried out the attack apparently used a tractor belonging to the family. 3. As part of the violence inherent in popular resistance events, extensive use is made of cold weapons, mostly by individual terrorists or networks of young Palestinians who do not belong to established terrorist organizations. The most prevalent type of popular resistance violence is throwing stones and Molotov cocktails at Israeli security forces and civilians, however, there are other types that are used less frequently such as vehicular and stabbing attacks. 4. Vehicular attacks are used relatively infrequently, but they are more lethal than stones or Molotov cocktails. For example, between 2000 and 2008 about 20 vehicular attacks were carried out, killing 15 people. Prominent among them were three attacks in Jerusalem, two using front loaders, which killed three Israelis and injured an estimated 100 (Israel Security Agency website, "Analysis of [Terrorist] Attacks during the Past Decade"). In 2012-13 there were a number of vehicular attacks in the Jerusalem area and throughout Judea and Samaria in which one Israeli civilian was killed and several Israeli security force personnel were injured (See Appendix). 5. The PA and Fatah support the popular resistance, (falsely) representing it as a nonviolent struggle(muqawama silmiya, "peaceful resistance," according to the PA). The PA provides the popular resistance organizations with financial and logistic support. It also gives its backing to political events encouraging the popular resistance and helps enlist international support. In addition, the PA does not condemn the attacks carried out within the popular resistance and its security forces do not take effective measures to prevent them. Hamas also supports the popular resistance, calling for it to be broadened even as it supports armed military-terrorist "resistance" and urges its increase in Judea and Samaria. 6. The most recent vehicular attack is one in a series, some carried out as part of the popular resistance and others military-terrorist actions(with nationalist or criminal motivation, or both). The attacks, which the PA does not condemn, are not connected to each other. However, they do not occur in a vacuum, and in our assessment they should be considered within the overall context of the current atmosphere and mindset in Judea and Samaria. The support the PA gives the popular resistance's violent activities, the way it condones deadly attacks in which Israelis are killed and the vicious propaganda campaign currently waged by Hamas – all provide a favorable, encouraging atmosphere for Palestinian activists initiating attacks on Israelis in Judea and Samaria, both military-terrorist attacks and popular resistance attacks, and are liable to encourage their continuation. 7. So far, we have not seen a PA reaction. 8. 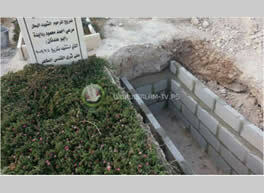 The official Facebook page of Fatah's office for enlistment and organization praised the attack, saying "May Allah have mercy on him, may Allah have mercy on him and situate him next to the shaheeds in paradise, may Allah have mercy on them, [they] have written history and honor for Palestine" (Official Facebook page of Fatah's office for enlistment and organization, October 17, 2013). 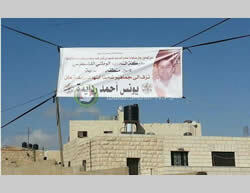 A mourning tent was set up in Beit Hanina by Younes Radeideh's family and official Fatah notices were hung mourning the death of "the heroic shaheed". 9. Hamas praised both the attack and the attacker on its Facebook page of Hamas in Judea and Samaria. Izzat al-Rishq, a member of the Hamas political bureau, sent the following Tweet: "May your hands be blessed…may the death of a martyr be pleasant for you, hero Younes Radeideh…" (Izzat al-Rishq Twitter account, October 17, 2013). The Hamas threat of another attack. 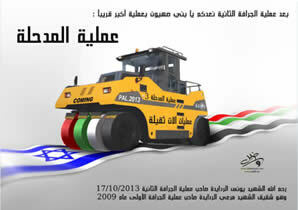 Top: "After the second tractor attack, we promise you, children of the Zionists, a bigger attack soon, the steamroller attack." Bottom: "May Allah have mercy on the shaheed Younes al-Radeideh, who carried out the second tractor attack on October 17, 2013, brother of shaheed Mari' Radeideh, who carried out the first tractor attack in 2009 (Hamas forum website, October 19, 2013). 10. Ismail Haniya, head of the de-facto Hamas administration in the Gaza Strip, gave a speech marking the second anniversary of the Gilad Shalit prisoner exchange deal, urging a renewal of the "mass intifada" (al-intifada al-jamahiriya) and initiate active "resistance" [i.e., terrorism and violence] in Judea and Samaria for the sake of "the liberation of Palestine." He criticized Palestinian security cooperation with Israel and called for formulating "a national Palestinian strategy that would include every option and all means available, including armed resistance and popular resistance, and political, diplomatic, media, popular and legal confrontations, as well as an academic and diplomatic boycott" (Al-Aqsa TV, October 19, 2013).